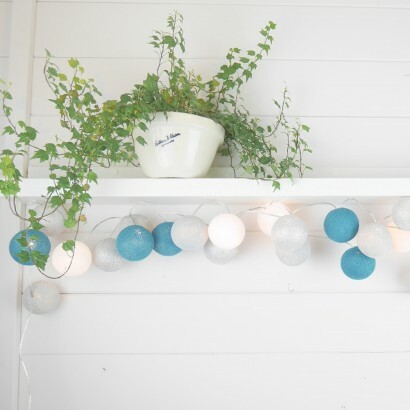 As cool as ice, these stunning contemporary cotton ball string lights are made with frosty silver, snowy white and icy turquoise hand made cotton balls to give your home a cool, atmospheric glow. 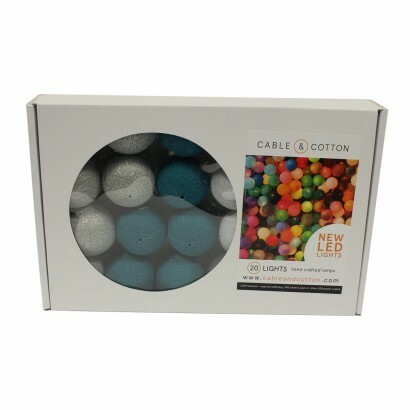 The stylish cotton balls are lit by pure white LEDs to cast a clean glow into your home that looks particularly impressive with white walls or features, illuminating the white for pure enchantment. The balls are boxed loose so that you can arrange them on the 20 LED light string allowing you to create your own bespoke lighting, and USB powered they can be plugged in to the mains with a USB plug (not included) to make a striking lighting feature. Will run for approx 7hrs from a 6000mAh power bank for fairy lighting on the go!